This BBC News video shows how the growing demand for fish in places like inland China is putting a huge stress on coral reefs. Most adult fish have been caught, so the majority of fish sold in markets are juveniles that have not had a chance to reproduce yet. Because of this trend there has been a downward spiral in fish populations and reef health worldwide. The world needs stricter fishing regulations ASAP, and if that doesn’t happen we will probably see the collapse of entire ocean ecosystems in our lifetimes. The bill to transfer management of the sacred summit of Mauna Kea to the University of Hawaii passed the state’s House Finance Committee on Tuesday. By the Committee’s own count, 900 people submitted testimony in opposition to the 10 or so in support. This number is not counting the testimony submitted by a dozen Kanaka Maoli (Native Hawaiian) scholars who signed a joint letter in opposition to the bill, as well as testimony from the Hawaii Sierra Club, the Royal Order of Kamehameha I, and several individual Native Hawaiian cultural practitioners detailing the history of destruction and desecration from the University’s 40 years of telescope construction on the summit. This bill is extremely dangerous for the future of our sacred summit and all of our conservation lands. It gives the University – the developer of the summit – control over what happens to the natural and cultural resources of the conservation district that currently protects the entire summit of the mountain, setting a terrible precedent for delegating the state’s conservation responsibilities to developers. The bill would also allow the University to establish its own private police force on the summit. These “rangers” do not have the same level of training or authority as the state resource enforcement officers who currently have jurisdiction over the summit. In fact, these “rangers” themselves have engaged in desecration of cultural sites, interfered with spiritual and religious practice on the summit, and endangered unique, fragile natural resources. In addition, the bill would allow the University to pocket state money with no oversight by establishing a special fund. For 40 years, the University has facilitated the theft of state money by foreign telescope owners who construct massive telescope facilities (and all of the gift shops, parking lots, and other support structures that go with them) on state land without paying rent to the state. In addition, millions in profits is made from the sale of patented information developed on the summit. Instead of offering to pay some of this back-rent (to help the state avoid drastic budget cuts), the University is proposing to legitimatize this history of theft by establishing a special fund into which revenue from the summit is deposited and from which only the University can withdrawal. 1. A legitimate management plan – This is a plan that protects the natural and cultural resources of the summit from unreasonable development. It is prepared and approved by the Board of Land and Natural Resources and accepted by the community. 2. An independent management board – the current set up is a puppet of the University with members chosen and paid by the University. 4. Fair Compensation – while no one, but the University, knows for sure how much profit is made off the summit, some estimates put it at $50-60 million a year. If the telescopes paid just that for the 40 years of back-rent owed to the state, taxpayers would earn $2 billion dollars. You can help protect Mauna Kea. Take action now! Click here and submit a personalized letter to Hawaii’s legislators. “I strongly oppose the University’s plans for the future of Mauna Kea. Enough is enough. The summit lands are ecologically sensitive and culturally sacred. Expansion of astronomy’s footprint on the mountain should not be an option. If a new telescope is truly needed, dismantle an old one. Mauna Kea should be available to the akua and to the people and to the scientists– in a way that puts pono first. Pono, meaning, in righteous balance for all concerned. You are our elected and appointed representatives, charged with the responsibility to excecute the wishes of the people, the caretakers of this land– not the empowered elite. Mauna Kea Summit is a conservation area and what remains should remain kapu. Protect it. I would like to add my voice to those protesting UH’s plans for the future of Mauna Kea. I am a huge fan of the science that is done in the observatories; however, this MUST be balanced with the rights of Kanaka Ma’oli and the needs of the environment. “I strongly oppose the University’s plans for the future of Mauna Kea. We should learn from the flaws of past Land Board mismanagement on Mauna Kea, keep the laws that protect Mauna Kea now, and exercise management authority towards the protection and restoration of this “wahi pana”, sacred place. Mauna Kea is ceded lands. The unrelinquished claims of the rightful beneficiaries have yet to be settled!!! For these reasons, I urge a strong stand for Mauna Kea. Uphold the protections currently in place, and preserve what is left of Mauna Awakea for it’s sacred purpose. It is our Kuleana – our Responsibility toward Akua (Creator) and the coming generations!!! I am a UH-Hilo alumni from 2004 and now live in my home state of Minnesota. I am deeply dismayed by the continued breach of ethics and law by the school where I earned my degree. It is embarrassing for the state of Hawaii to continue to let these institutions bulldoze their cultural heritage and environmental resources in the name of scientific advancement. Hawaii is becoming a sad cliche in management of resources and in the treatment of indigenous peoples. Has the astronomy community not taken enough land and proven enough mismanagement of what they have already taken? Isn’t it time for Hawaii to join the modern world and learn mistakes of the past and err on the side of protection and conservation? Once these sacred places and natural resources are taken, they are gone forever. They will become a paragraph in a history book on yet another breach of trust between government and its local population. I did my UH Environmental Impact Statement paper in college on the Mauna Kea Plan. It didn’t take a masters degree to see how many laws have been violated or skirted around. I have many fond memories of hiking on Mauna Kea and respect and want to extend my support from afar for those who continue to try to preserve what is left. “I vehemently oppose the University’s plans for the future of Mauna Kea. The lands of Mauna Kea are ecologically unique and culturally significant that is why they are protected as a conservation district. Conservation — not telescope construction — must be focus of all activity there. Your help is needed right now. Lobbyists for the University of Hawaii, backed by powerful foreign telescope-developers, are pushing hard to take control of Mauna Kea’s public trust resources and override the conservation laws currently barring further development on our sacred summits. If successful, they will use this authority to write their own rules, approve their own permits, and shut-out the public. Public trust resources cannot be protected if the developers are allowed to police themselves. You can help stop UH’s land-grab on Mauna Kea’s sacred summit. After 40 years of mismanagement, tell the State Land Board and the Legislature that enough is enough! “The University’s lobbyists will say anything to get their way. I heard them tell Legislators they had community consent. I am from the community and tell you what, they have nothing of the sort.” — Kukauakahi Ching, Native Hawaiian Practitioner. Our sacred summits — Mauna Kea and Haleakala — are protected by law as conservation districts. These are public trust ceded lands–Hawaiian lands–held by the state in trust for the people of Hawaii. Yet, today Mauna Kea’s public lands are exploited by foreign corporations and the University, who are profiting from telescope activities on the summit at the public’s expense. “The rent from the foreign telescope-owners is 30 years past due–they have paid only $1 a year to misuse Mauna Kea. If the state had been collecting the $50 million dollars a year from these foreign telescope-owners, like we suggested to them years ago, we would not have these budget shortfalls now. Remember, $50 million in 1 year is $100 million in just 2 years. They owe the people of Hawaii for 30 years of back rent. How dare they suggest to short-change the taxpayers now.” –Kealoha Pisciotta, President Mauna Kea Anaina Hou. Forty years of uncontrolled telescope construction has desecrated cultural sites, contaminated the ground above the primary aquifer, and destroyed 90% of the endemic Wekiu’s habitat. Today, developers are vying to build two new telescopes (along with roads, parking lots, office buildings, and gift shops) on undeveloped habitat around the summit area. One of them — owned by the California Thirty Meter Telescope Corporation — is larger than all the current telescopes combined and will bulldoze the last pristine peak near the summit. The only thing stopping them is the law. That is why the University is working hard to overturn the laws that currently protect our sacred summits and limit telescope construction. Two courts of law and two state audits have already found that the telescope industry violated the state and federal laws meant to protect Mauna Kea. The only way their future telescope construction plans can go forward is for the University and the telescope developers to change and exempt themselves from these protective environmental laws. 2. Lobby the Legislature to pass one of four bills that will hand-over authority for managing Mauna Kea to the primary developer of the summit, the University of Hawaii. All of it comes down to the University’s same, long-sought goal: make it easier to exploit Mauna Kea for money. The latest proposal on the table would allow the University to restrict public access (including how and when Hawaiians may worship at the sacred summit), pocket all the money made on Mauna Kea, and exempt themselves from public oversight. This is a public policy and legal nightmare! “The University wants to gate the road to Mauna Kea–the road was paid for by taxpayers, it’s a public road. The University wants to require Hawaiians to get a permit to worship–Mauna Kea belongs to Ke Akua, they cannot lock the people out of the temple. Even if Hawaiians could get a permit, it would mean they couldn’t bring their non-Hawaiian friends and ohana to ceremony. This is discrimination! Who is the University to say who can and cannot worship?” — Paul Neves, Alii Ai Moku, Royal Order of Kamehameha I. Your voice can help preserve the sacred temple and delicate ecosystem of Mauna Kea. Take action now to tell the Legislature and the Land Board that Mauna Kea is still not for sale. A lawsuit seeking basic government documents has been filed in Federal District Court against the Western Pacific Regional Fishery Management Council (WESPAC), the National Oceanic and Atmospheric Administration (NOAA), and the U.S. Department of Commerce (DOC) by the Conservation Council for Hawaii, KAHEA: The Hawaiian-Environmental Alliance (KAHEA), and the LOST FISH Coalition. WESPAC has been under scrutiny related to allegations of illegal lobbying, including actions to try and halt the NWHI and CNMI National Marine Monument declarations, and for funding the controversial Puwalu Series, a lobbying ploy to pass legislation curtailing community-based-fishing-management programs in Hawai`i. Based in Honolulu, WESPAC is the subject of at least two active federal investigations; one by the U.S. Department of Commerce Office of the Inspector General (IG), and another by the U.S. Government Accountability Office (GAO). While disclosure of public documents is required under Federal Law, the WESPAC situation is made worse by WESPAC’s refusal to use uniform information procedures. “There is a shocking insensitivity of WESPAC and its executive director, Kitty Simonds, to the required open and transparent decisionmaking,” said lead counsel Peter Van Tuyn, Esq. “As President Obama states, a ‘democracy requires accountability, and accountability requires transparency.’” This lawsuit is intended to force the doors open on this rogue council and ensure that accountability. The Western Pacific Regional Fishery Management Council (WESPAC) is one of eight regional councils established under the U.S. Magnuson-Stevens Fishery Management and Recovery Act to manage the nation’s offshore marine resources. We opened up the Star-Bulletin on Sunday, and there in the Gathering Place section was long-time NWHI advocate Uncle Buzzy, calling for a renewed public commitment to a true pu`uhonua — a ‘forever sanctuary’ — in the Northwestern Hawaiian Islands. Ho‘omaika‘i ia Uncle Buzzy! Uncle Louis “Buzzy” Agard, is a founding Board Member of KAHEA and a revered kupuna (elder) who lived and fished in the Northwestern Hawaiian Islands (NWHI) for many years. 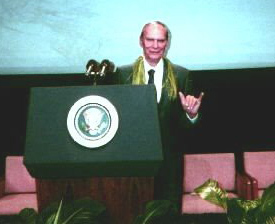 In 2001, he was honored by President Clinton at the establishment of the NWHI Coral Reef Ecosystem Reserve. Today, Uncle Buzzy still serves on the citizen advisory council (RAC) for the Reserve and remains a staunch advocate for the strongest possible protections in the NWHI. In 2005, the state of Hawaii finally embraced what native Hawaiians have known for generations: the Northwestern Hawaiian Islands are a delicate, sacred ecosystem that must be respected. The state took a visionary step forward establishing the first state marine refuge in the NWHI and requiring that human activity there “do no harm” to this fragile ecosystem. 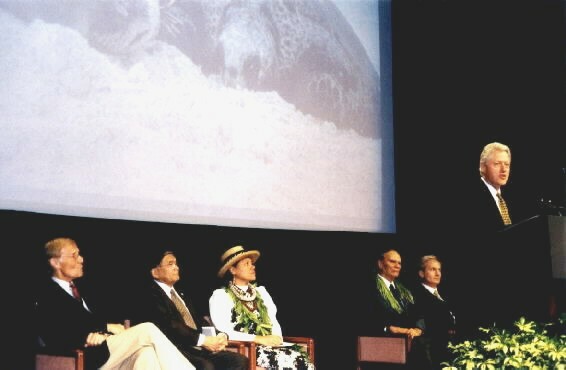 In 2006, the federal government followed suit, establishing the Papahanaumokuakea National Marine Monument. These protected areas rely on permits to control the human footprint up there. But today more and more people are going to the NWHI for research, education, even sightseeing. Any time you set something off limits, people want to go there; this is the irony of our success in establishing protections for the Northwestern Hawaiian Islands. Already this year, permits have been granted to allow unlimited numbers of people to go to the NWHI to do any kind of dredging, discharging and taking, even recreational fishing. Researchers have violated their permits and we have seen little will for enforcement. This is wrong. We must change our attitude about this place entirely — there should be no human footprint there. Millions of dollars have been set aside by the federal government, and with good intentions. But money is a magnet for people. They see the money and their first question is, “What can I propose to do up there?” A scientist will say to the Hawaiian fisher, “Take only what you need,” but in his research practice he doesn’t heed his own advice. This is not why the people of Hawaii and the world fought so hard to protect this place. The Northwestern Hawaiian Islands is a place of great hope for the future of the resources in our oceans, and it is for this reason that we set it aside. Let us honor the commitment we made to protect this fragile place as a true pu`uhonua.